A new tax on sugary drinks designed to generate revenue for cash-strapped Cook County will be the third burdensome tax applied to soda prices in Chicago, making a $4 12-pack of soda in the city cost $5.97. Beginning July 1, residents of Cook County may notice their grocery bills growing as a penny-per-ounce tax on artificially sweetened beverages takes effect. The new tax will be added on top of Chicago’s highest in the nation sales tax of 10.25 percent and the city’s 3 percent tax on non-alcoholic beverages. With the new sugary beverage tax, soda in Chicago will be some of the most expensive in the nation as a $4 12-pack of soda will cost $5.97, an effective tax rate of nearly 50 percent. The new tax on sugary beverages will also affect fountain drinks, energy drinks, tea, coffee, diet soda and juices that aren’t 100 percent fruit or vegetable juice. The Illinois Retail Merchants Association filed a lawsuit against Cook County June 27 in an effort to stop the penny-per-ounce tax on sugary beverages. Retailers filed to halt the tax, claiming that the tax is unconstitutionally vague and not uniform in what it taxes. A statement released from the Illinois Retail Merchants Association claims that the Sweetened Beverage Tax creates illegal and unsubstantial classifications of beverages, such as differentiating a bottled Frappuccino sold in a convenience store, which would be taxable, from a Frappuccino prepared in a coffee shop, which would not be subject to the tax. Some 200 store owners and shopkeepers met outside the Thompson Center June 27 to protest the new tax on sugary beverages. In Illinois, as cigarette taxes have increased, total tax revenue collected from cigarette taxes has decreased as an estimated 1 in 5 cigarettes in Illinois are smuggled across state and county lines to avoid paying Illinois’ lofty excise taxes. 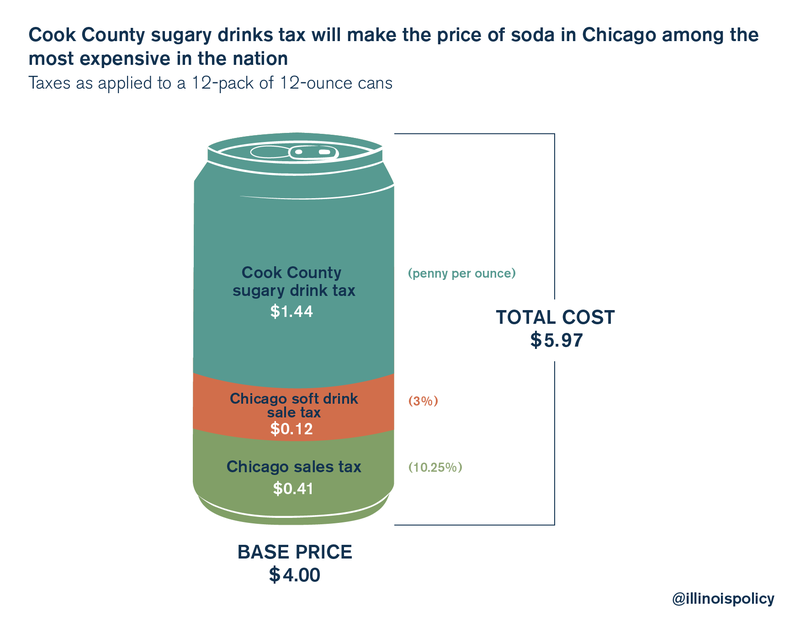 Much like cigarette taxes, it’s possible a soda tax will drive Illinoisans to cross state and county lines to buy their soda where it’s taxed less. If past trends hold true, it’s possible the new taxes on sugary beverages will drive business out of Illinois and Cook County rather than generate revenue. A tax on soda does little to fix the underlying structural reforms the county and state need. Raising taxes on soda will only further increase Illinoisans’ total tax burden. And both Democrats and Republicans alike have proposed plans to raise additional taxes by more than $5 billion, which would increase the average Illinois household’s tax burden by more than $1,125 each year. But Illinoisans have expressed that they don’t want a budget that hikes taxes. The Illinois Policy Institute has introduced a budget proposal that offers real reform without raising taxes. This kind of reform-minded, no-tax-hike proposal is in line with what Illinoisans want. Lawmakers should use that as a framework rather than increasing taxes on poor Illinoisans via a soda tax.